Lucky's Balloon Twisting - There is a wide variety of balloon twisting choices from the simple to the elaborate. And lots of clown humor comes with the balloon twisting, plus a free clown bag to carry your balloon creation. 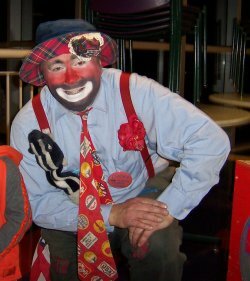 Lucky's Magic / Clown Shows - Lucky does great clown & magic shows for a child's birthday party and other events. All shows have lots of interaction and entertain both young and old alike. Lucky serves Dayton and SW Ohio, including Cincinnati, Columbus, Greenville, Lima, and also Richmond, IN. FYI... Lucky is a happy, friendly and fun clown and has never had issues with kids being afraid of him. However, a child may still be initially apprehensive, due to the reports of 'bad' people dressed as clowns. So, Lucky can also come as a clown but with very little face make-up, thus putting an apprehensive child at ease. To see examples of Lucky's entertaining, click on one of the videos in the upper right corner. Be sure and checkout Lucky's Background Checks & References. LUCKY's goal is to return phone calls and emails ASAP!! We have attempted to respect image and clipart copyrights on this site, but please inform me of copyright concerns with any content so that I can address them as needed.